This topic contains 17 replies, has 2 voices, and was last updated by VCR 1 year, 5 months ago. Since I just got the controller and receiver working I thought I start this topic here. Not sure if its in the right place since it will also show off a tractor, but the tractor isn’t that interesting and just a guinea-pig I think its the right category. I wanted to use the RCTractorGuy library at first, but since all of it is in the library and nothing in the sketch, and I don’t want to modify a library i don’t fully understand, I decided against it. I would have had to use the Basic Controller anyways, as i can not find a Pro Mini Mega, and all the displays and stuff is too much for me now. I just want to get a basic controller working. This is a complete work in progress but the plan is to keep it simple. Anyways, lets start with the Controller. I used a case from a IR helicopter because of the battery tray. Then I added a cheap switching regulator board to create 3.3V. The NRF24 and the Arduino both run off those 3.3V just fine even though the Arduino is a normal 5V Arduino. So i’ve used a normal 5V Pro Mini, it is the cheapest one I could find (still has a Atmega168 chip) and cost only 1,45€. Additionally, two joysticks, a 200µF capacitor, two pull-down resistors and a header for programming. Thats it (for now). The PCB is made using the Toner Transfer method and Ferric Chloride. I don’t plan on adding a display, but I will add 4 switches to select channels, another potentiometer and four buttons for lights or additional functions. With that, all the inputs on the Pro Mini are used. If i need more Buttons I can always add a second Pro Mini and connect via the serial port, but I think for the basic controller this is enough. I might build a more advanced version in the future, but for now that is more than I need. Now to the receiver part. The receiver uses an Arduino Pro Mini, a NRF24 module and a small PCB on which the NRF24 module is mounted. Also a AMS1117 3.3V regulator and again a 200µF capacitor. I’m also using the TB6612FNG motor driver. But back to the controller. This Pro Mini has extra pins for pin 11,12 and 13 for the SPI bus. No idea why, but i like that. The wires are out of the way that way. The next thing to add (receiver and sender) is a adress system, buttons and pins for lights, maybe indicators.. Stuff like that. I also want to implement some basic inertia simulation so the tractor doesn’t launch like a racecar if you don’t touch the controls very carefully. The same for the steering, the little servo is just way too quick especially at 7.2V..
Now to the tractor. It is a Deutz D16006. The base is made of fine grained red beech wood. 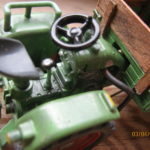 (Two reasons, first, we use it as firewood, second, its incredibly fine and sturdy hardwood, perfect for creating models) the details are made using Polystyrene. When I started the build I used to build everything out of wood. Nowadays I probably would use Polystyrene for the complete tractor, although it might be too light then. Anyways.. As I said, the tractor is not pretty and not finished. I just use it as a test vehicle for now. And here with the Receiver board test-fitted.. A lot of cleaning up wires to do still.. I also have a video from the very first test drive. Sorry for the horrible quality, I used the wrong setting on the camera. Some progress has been made. I’ve added addresses to the whole thing. But i’ve also added some buttons..
Now, first i thought that i had enough pins, but then i realized that a few more buttons can’t be bad. So i thought about adding a second arduino. But as i have 4 free analog inputs that is not neccessary yet. Two of the free analog inputs i want to keep in case i need more potentiometers later on (i want to add at least one more). But that leaves me with two analog inputs left.. Good for at least 12 Buttons. Anyways, i have added two small PCB’s to the controller, one for the address jumpers and one for the 6 pushbuttons. Now, how do you get 6 pushbuttons on one arduino input? Its pretty simple, using two voltage dividers in series. Each one is a 75:25 divider which gives 4 different values depending on which button is pressed. Now you can add two more buttons pulling the input pin either high to vcc or low to ground. In total, 6 buttons. Only drawback, you can’t press multiple buttons at the same time. The resistor value doesn’t matter as long as it is above 1k and R1 & R3 have the same value and R2 and R4 are roughly double the value of R1. I didn’t have exactly double so the values in the shematic are what i used. If you have a different divide you have to adjust the values in the sketch to compensate. // get 6 buttons from one analog pin using voltage dividers and analog read. As you can see, the analog value is read first, then we see in which range the analog value is.. And according to that we know which button is pressed. Since the two voltage dividers are in symmetrie, when no button is pressed its always VCC / 2 or in analogRead values ~512 (since 1023 is VCC). The best way to get the right values if you are using different resistor values is to just Serial.println(analogRead(analogPin)); and press each button and note the value. Then change the range values to fit those values. Here are a few pictures and a little description how i make my PCB’s in case somebody wants to know. Instead of the usual iron method i hadn’t much luck with, i am using a wood stove. Once that is done i spray a bit of water on the hot PCB, it seems to seperate the paper from the toner better that way. The paper peels off very easily and cleanly and the toner is transfered perfectly. the toner just did not transfer properly on the light areas. This is what it looks like after etching. I use Ferric Chloride to etch, i guess its just personal preference. It can make a mess, but doesn’t require anything special but some sort of plastic or glass tray to etch in and gloves. At the moment i am using one of the buttons to switch between 3 max. drive speeds to allow for finer control.. (A detail i saw in the RCTractorGuy code and i really liked) but i want to use some seperate buttons or switches to do that at some point. The 6 buttons in the middle of the controller will be used for lights and turn lights and that stuff i guess. But i am not even sure if i will use lights on my vehicles.. I hate having wires everywhere for the LED’s.. And although lights are extremely cool looking, they are not useful. In all the time “playing” with Siku Control i might have driven in a dark room maybe 4-5 times if at all. Usually i want to see the model drive.. So i don’t need any lights anyways. So i’m not sure yet.. Maybe just indicators and normal lights.. Not full worklight stuff.. We’ll see. // change the following two values to adjust, the lower the value the quicker the final value will follow the raw value. diff = diff / steeringInertiaValue; // the difference gets divided by the "inertia value"
There are also some Bugfixes, the speed selection works now as it’s supposed to. There were also some changes to the tractor code. Headlights, battery voltage measurement and warning when the voltage reaches a low value for example. Also the address stuff works now. Since I used a 2 cell Lipo I had to use a voltage divider for the battery voltage measurement as the Arduino can only take a maximum of 5V to its input pins. I’ve used a 75:25 voltage divider because my Arduino runs on the 3.3V regulator with the NRF24 module now, so the max. voltage I can supply to the Inputs is 3.3V. Therefor at 8.4V max voltage if the batterys are fully charged I get only 25% of that, ~2.1V, at the input pin. // some LiPo cells come with protection circuits on the cell itself, but the cheap ones i use don't. // also most multiple cell lipos dont. I use a 2S Lipo in this tractor. // I did want to take the internal voltage into account but floating point math isn't that great on the arduino, and since i had a conservative number for the lower limit i think we'll be fine. // you need to change this whole thing if you are not running the arduino off of a 3.3V regulator!!! I have also added all the output pins and the steering servo limits to the top of the sketch so they can be changed quickly without scanning through the sketch. I am not an expert in the subject but I will try to make a clone. Do you have any circuit schematics that you can share? I have the PCB Layout in Fritzing, I don’t have any shematics. But I can draw some, its pretty straight forward not much to it neither the sender nor the receiver are complicated. Can you help me finish the drawing? I would like to try to optimize the receiver board to function more as a shield for the Arduino. This reply was modified 2 years ago by VCR. The NRF24 pins are fixed, the other ones you can change around in the sketch, they are defined right in the header. You just need to make sure you use a PWM Pin for the motor PWM output. Although if you build in 1/24 scale you might use a proper speed controller instead of the TB6612FNG I guess so you might have to change that whole part anyways. The sender code hasn’t the Input Pins defined in the header yet, you can still change them around. Aside the fact that the analog pins have to be analog pins there is nothing special going on. I hope I didn’t make any mistakes in the schematics.. Since I’m too stupid to find the “edit” button I can’t edit my last post. Anyways, regarding the “shield” idea.. Here is the second version of my receiver. I don’t know if it works yet, I made it two or so weeks ago but didn’t test it yet. I tried to get it as small as possible, but it is still too big for my other tractor. Again, thanks for sharing all this work. As soon as I have a little time I will carefully study all the information you have made available. For now I will concentrate on the receiver. It did not go very well. I do not think it will be possible to weld. If you drilled first and then routed the traces maybe your bit has a lot of runout? Aside from the holes it doesn’t look bad, though. Thank you modelleicher. I’m going to buy a new drill, maybe with a slightly lower diameter. I will also redesign the plate to have more copper around the holes. CNC is an excellent tool for manufacturing small parts. I’m using an MF70 with Chinese electronics. I now have added the 2S Lipo in the front, so I can not use the entire hood for electronics anymore.. It is quite “full” in the tractor now. Good thing it is “finished” as far as I’m concerned, I won’t add any other electronics/features. Just make it look better. @vcr, how did the smaller hole size go, did it work? This reply was modified 1 year, 11 months ago by modelleicher.